Reference: Emerson, Joanne B., et al. “Host-Linked Soil Viral Ecology along a Permafrost Thaw Gradient.” Nature Microbiology, vol. 3, no. 8, 2018, pp. 870–880., doi:10.1038/s41564-018-0190-y. Wetlands are flooded environments with a limited amount of oxygen. In these environments, breakdown of organic carbon occurs very slowly. For this reason, wetlands are especially good at storing carbon. Over time as plants grow and die, their leaves are left in the soil to eventually be decomposed or stored as complex carbon compounds. Decomposition results in the release of carbon from the wetland as a gas, normally either carbon dioxide or methane. In the atmosphere both of these gases have strong greenhouse properties and contribute to climate change. Wetlands are a large component of removing and adding carbon gases to the atmosphere or lithosphere (carbon stored in soil and rocks), and they store 20-30% of the Earth’s soil carbon. Bacteria are the main driver of carbon break down in wetland environments, so the rate of decomposition depends on factors that control microbial communities. In arctic wetlands, which store nearly twice as much carbon as the atmosphere, one of these factors is temperature. Much of arctic soils are frozen year-round as permafrost, limiting microbial activity and decomposition. As climate change warms arctic environments, permafrost is beginning to thaw, increasing microbial decomposition in the soil which is releasing greenhouse gases to the atmosphere. 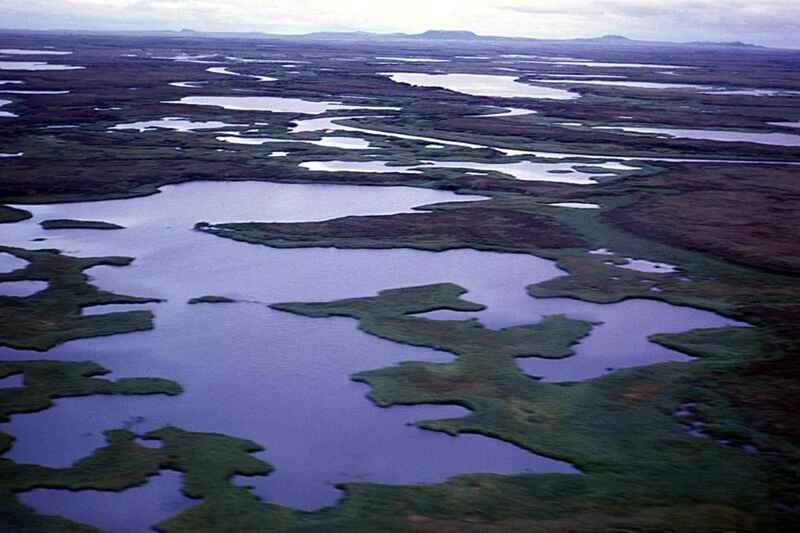 Scientists have studied many different factors that regulate the carbon cycle, and now cutting-edge research tells us that viruses are another large influence controlling bacterial activity and carbon storage in arctic wetlands. Is it just a (Bacterio)phage? Many people are familiar with the viruses that infect humans with the common cold, Polio, smallpox, etc. Viruses are able to infect all types of living things in order to reproduce. In fact, most virus diversity revolves around microorganisms like bacteria. In the ocean there are ten times more viruses that infect bacteria, called bacteriophages, than there are bacteria themselves. To reproduce, viruses must infect cells by inserting viral genetic information that is assimilated into the infected bacteria’s genome. The bacteria replicate the virus’ genes and create new viruses that are released and can infect more cells. For single-celled bacteria, the release of new viruses results in the bursting death of the entire bacterial cell. In cases where bacteriophages are infecting many cells in a bacterial community, viruses can virtually eliminate a species of bacteria from an environment. Each type of virus specifically targets one species of bacteria, so tracking virus diversity could tell researchers information about the bacteria they infect. If there are enough viral infections of a bacteria species that breaks down organic matter, for example, these viruses can significantly reduce carbon emissions from an environment and have an impact on the global carbon cycle. How Can We Study Viruses? New research techniques attempt to identify the role viruses could play in nutrient cycles by evaluating virus genetic material. Genes encode information that is specific to each type of virus and we can use this molecular code to predict what types of viruses are present in a given soil sample from an arctic environment. Groundbreaking research from a collaborative team of scientists from different disciplines aimed to look more specifically at how viruses can alter the arctic soil environment. The study, published in Nature: Microbiology in 2018, related the DNA of virus populations to bacterial populations to find out how viruses were impacting bacteria and therefore changing carbon cycling patterns. Soil samples from northern Sweden were taken along a gradient of permafrost thaw, representing three scenarios of changing arctic wetland conditions. Researchers extracted DNA from the soils and matched the fragments in the new samples to previously documented DNA codes. The matching process allows researchers to pick and choose which DNA fragments are important in understanding the viral community. The analysis identified genetic information from 17,434 separate virus populations that are thought to represent individual species. This is a substantial increase in our knowledge of arctic soil viruses. A small subset of these viral populations were evaluated more closely to determine what types of bacteria the identified viruses could infect. Viral community composition differed between the three levels of thawing and confirms what research has already told us about shifting bacterial conditions in these environments. Virus community compositions depended on what types of bacteria were present and other environmental factors that control bacterial abundances. Another key result of the analysis is the conclusion that many viruses that were present infect types of bacteria that are key players in global carbon cycling. Additionally, the researchers found virus-encoded genes that would facilitate the breakdown of complex carbon compounds in the soil that normally would be too energy intensive for bacteria to break up. When viruses spread these genes around, infected bacteria could develop the ability to decompose this stubborn carbon and speed up decomposition in these environments. The research concluded that viral abundances are very good predictors of carbon measurements in the soil, more than bacterial abundances themselves, meaning that understanding virus communities in our soils is essential for studying shifting global carbon dynamics.